November, 3, 2016 — World-renowned digital superstar, actor, creator, and entrepreneur Nash Grier officially launches his very own emoji app, NashMoji™, in collaboration with AppMoji. NashMoji™ is available now in the Apple app store for $0.99. Speaking to a cumulative social audience of over 30 million fans on a daily basis, Nash remains a modern pop-culture icon. 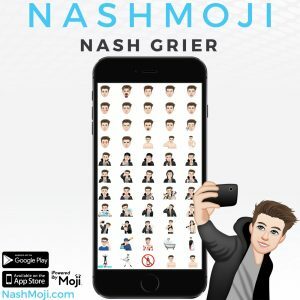 NashMoji™ enables fans to speak his language by bringing an assortment of brand new emojis modeled after the 18-year-old star’s facial expressions, mannerisms, and lifestyle right to their fingertips. The app reflects his passions and personality, representing him with a myriad of expressions and animated emojis. These emojis encompass everything from his devout environmentalism and love for animals to his daily routines shared on SnapChat and his iTunes #1 movie The Outfield. Nash joins the ranks of other stars who have received the emoji treatment from AppMoji such as Steph Curry, Amber Rose, Future, Wiz Khalifa, Rick Ross, G-Eazy, DJ Snake, Fetty Wap, and many more. The deal was brokered by AppMoji’s representative Steiner Sports Marketing, Inc. and Nash’s representative Legacy Talent and Entertainment, LLC.